Kate Middleton, affectionately known by her loyal subjects as Duchess of Cambridge, is a fashion icon. She was topping best-dressed lists even before that stunning Alexander McQueen wedding gown of hers. It should come as no surprise, then, that her 2-year-old daughter, her royal Princess Charlotte, is following in her footsteps. Whenever she appears in public, people rush on over to Google to try and find whatever adorable cardigan or romper she was spotted wearing, according to Vanity Fair and eBay. While the young princess’ outfits typically are affordable, many of them are exclusive to British brand John Lewis. Getting them in the United States, on the rare occasion the pieces aren’t sold out, would be difficult — and pricey. Because we feel for you and love to shop (who doesn’t), we’ve compiled five lookalike options for Princess Charlotte’s best looks. The alternative options are both affordable and available! Take a look at Charlotte’s outfits below, and click through the links to find our alternatives. Seen here at the end of 2016’s Royal Tour of Canada, Princes George and William, the Duchess of Cambridge, and Princess Charlotte wave farewell at Victoria Harbour Airport. To get Princess Charlotte’s look, follow a staple formula — cardigan and floral dress, cable tights, and Mary Jane flats. Don’t forget about that darling little barrette! In this official portrait, taken at the family’s Norfolk home to celebrate Charlotte’s second birthday in April, the princess is wearing an adorable sunshine-yellow cardigan with blue sheep and a bit of fair-isle accenting. The John Lewis cardigan sold out lightening fast after the photo was released, and it’s still not in stock! If you’re drawn to the adorable color, this bright yellow cardigan is a nice alternative. More interested in the sheep detail? Give this inexpensive sweater a shot. Lastly, if you zeroed in on the fair-isle theme, this cardigan is super cute. Whichever you choose, don’t forget to accessorize with a pretty blue bow! Pictured here on Christmas Day 2016, Charlotte is wearing a navy blue swing coat and a burgundy dress with — once again — burgundy accessories. 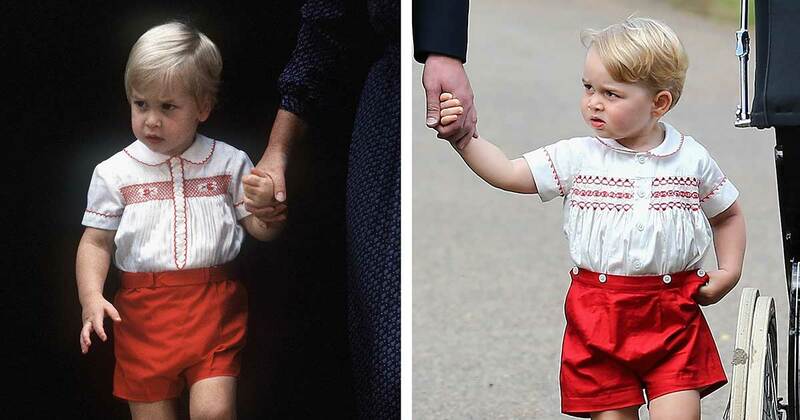 Kate is clearly not one of those famous parents who only dresses her kids in an outfit once. We wonder if it’s the little royal’s favorite color. We digress. The chic look is super easy to replicate. Start with a simple, long-sleeved dress and cable tights. Any plain Jane flats will do, but we prefer these velvet, bow-topped flats. Add a navy wool coat and burgundy barrette — feel free to reuse the one from the first look — and your daughter will be good to go! The great thing about this look is that it reuses the barrette and shoes previously mentioned, allowing you to save money and do some mixing and matching. To get this look, all you need is a fun, floral dress (we chose a more casual shirtdress with a braided belt) and some delicate white socks — done! Charlotte is a beauty in blue here, pictured attending a children’s party for military families during the Royal Tour of Canada in September 2016. Like the other looks shown here, this one has some common pieces. Pair the velvet flats, blue bow, and white socks already mentioned above with this adorable two-piece dress and cardigan set. Voilá! Note that this dress set comes with ballet slippers if you’d prefer that look instead. Want to see more stories like this? Let us know in the comments! Don’t forget to SHARE this story with other parents on the hunt for a good deal!